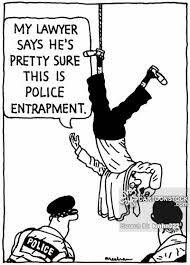 Entrapment is used in criminal proceedings when the accused has been induced by law enforcement to commit a crime that he/she was not predisposed to commit. It is based on the idea that is it is fundamentally unjust for law enforcement or other government agents to originate a criminal design, implant in an innocent person’s mind the disposition to carry out that criminal design, and then induce commission of the crime so that a prosecution may take place. State v. Perez, 438 So. 2d 436, 438 (Fla. 3d DCA 1983). 1) A law enforcement officer, a person engaged in cooperation with a law enforcement officer, or a person acting as an agent of a law enforcement officer perpetrates an entrapment if, for the purpose of obtaining evidence of the commission of a crime, he or she induces or encourages and, as a direct result, causes another person to engage in conduct constituting such crime by employing methods of persuasion or inducement which create a substantial risk that such crime will be committed by a person other than one who is ready to commit it. Entrapment defenses ensure fair play and justice when the bad behavior of law enforcement leads to an arrest of an otherwise innocent person.